Autonomous vehicle program at Florida Polytechnic University. Florida Polytechnic University has an exciting and growing autonomous vehicle education and research program. We have a specialized course in Autonomous Systems and Self-Driving Vehicles. This course, developed with partnership with Massachusetts Institute of Technology, focuses on the technologies, algorithms, design, and development of autonomous systems. In addition we have a robust transportation and logistics program geared towards students interested in advanced mobility and logistics topics. Our project based education is focused on applied principles of AV. This includes projects such as; a student developed self-driving golf cart, a solar-powered self-driving golf cart, a self-steering/driving electronic bicycle, an autonomous, follow-me drone for first responders. Our planned flow for autonomous vehicle engineers focuses on current enabling technologies and required software techniques for our future transportation engineers. 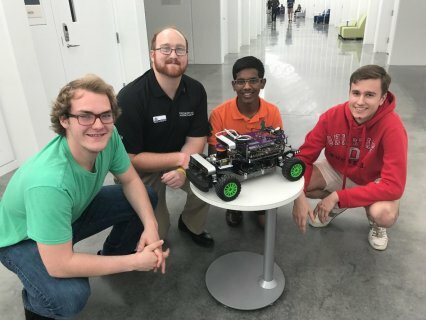 In addition to our undergraduate program, Florida Polytechnic University plans to introduce an executive certification for Autonomous Vehicles.